Santa Claus Has Come to DFW! 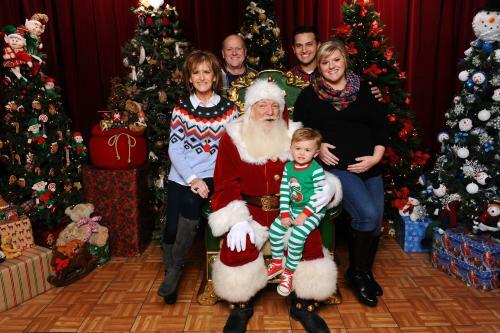 There are a number of places you can choose from to take your photo with Santa, but we've compiled this list of some of the best here in DFW. We hope you've been nice! The Galleria has a new winter wonderland for you to explore this year! Visit the new Santa's Village to have your photo taken with Santa. You can also take your photo in front of the holiday village mural and post on Instagram using the hashtag #GalleriaHoliday for a weekly chance to win a $100 Galleria Dallas gift card. And when you're done exploring the holiday village, check out all the other holiday events going on at the Galleria including Illumination Celebration, ice skating performances, and even a holiday circus. Have you ever wondered what Santa's house looks like? Visit Northpark Center in Dallas and you can visit with the big guy in his cozy living room by the fireplace. Tickets to visit with Santa are available starting at 9:00am Monday-Saturday and 10:00am on Sunday. And the first visits start at 11:00am on Monday-Saturday and 12:30pm on Sunday. If you want an early time slot, we'd recommend getting there early to stand in line for a ticket. And once you have your ticket, there's plenty to do while you wait - you can shop around the mall, listen to Storytime with Santa Claus, check out the trains, or eat at one of the delicious restaurants. Your little ones will love visiting the Ice Palace at the Shops at Willow Bend which houses a 30-foot ice dome complete with snow falling, a light show and more! You can also check out the larger-than-life snow globes, leave an icy handprint and sit on the Ice Throne. And at the end of your visit, you'll receive a special gift from him! If you don't want to wait in line, you can purchase a Fast Pass. Santa is available for visits from 10:00am-9:00pm Monday-Saturday and 12:00pm-6:00pm on Sunday with occasional milk & cookie breaks. Did you know that Santa is apparently a Cowboys fan? I mean, it makes sense, right? 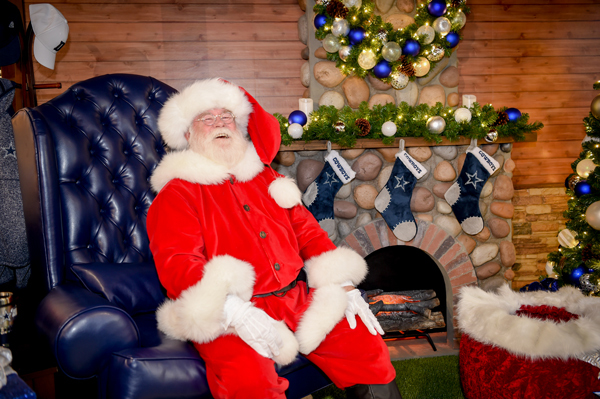 This year, maybe consider visiting Santa inside his Dallas Cowboys cottage. 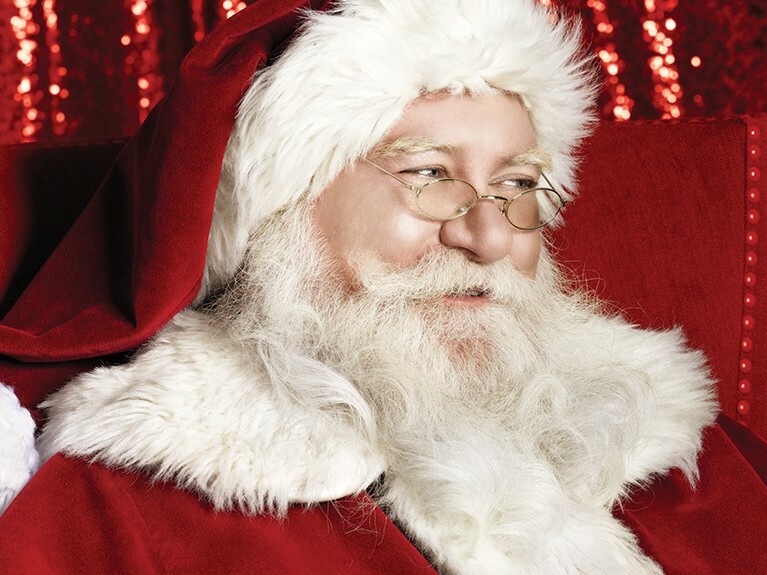 Appointments are required to visit Santa and there is a maximum of 5 children per appointment. You'll also be required to put down a $40 deposit upon making your appointment. That will get you a 5x7 photo, but you can purchase additional sheets for $9.95 each. And all images will be available via digital download. This is one of the only places in town where you can get a FREE photo taken with Santa. In addition to your free photo, they have free crafts, activity tables, and a toy arcade. 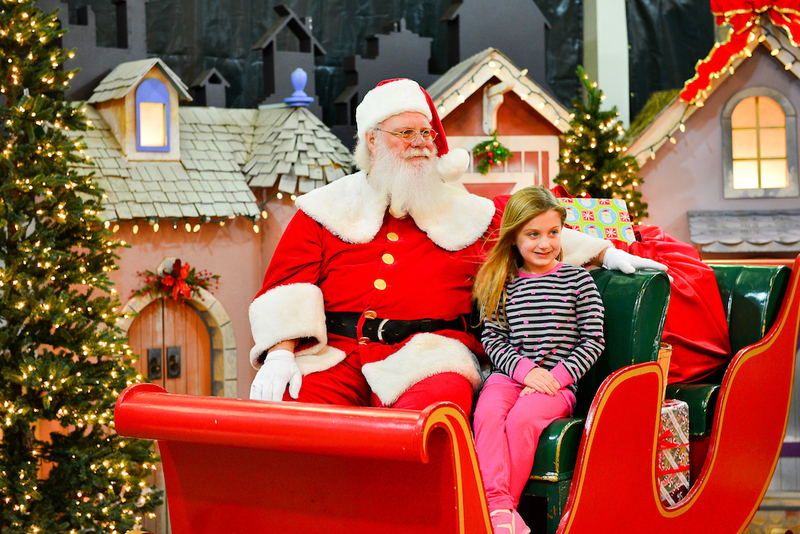 You'll need a Bass Pass which provides a time slot to see Santa, so get there early because they go quickly! After riding the North Pole Express, you'll obviously want to go visit Santa! He's located just across the street from the train depot and is ready to meet your kiddos and take a photo with them! You can reserve your spot to see Santa online and you'll receive your pictures before you leave. Santa will also have certain days when your furry family members can come have their photo taken as well! There's more than just Santa to see at the Gaylord's Lone Star Christmas experience! You can visit their well-known ICE! exhibit. Or you can decorate gingerbread houses, experience their outdoor ice rink, snow tube, or enjoy cookies with Mrs. Claus! Cost: For pricing information, please call the Holiday Concierge at 817-229-8774. Visit the jolly man himself this year at the Santa's Village pavilion in Rustin Park. And for the first time, this year you can reserve your family's private, no-wait visit with Santa. To make your reservation and get more details, please call 972-723-9794. Visit Santa's Workshop at The Parks Mall at Arlington where you can test and design one-of-a-kind toys with Barbie, Hot Wheels and Thomas & Friends. You can avoid waiting in line by making a reservation online. The Parks Mall is also home to other fun, festive activities like Pet Nights, Holiday PJ Day, Ugly Sweater Day and more! Enchant Christmas is back to illuminate Texas skies this holiday season. You can explore the World's Largest Christmas Light Maze, glide across the ice skating trail, visit Santa and Mrs. Claus, and shop around the Christmas Market vendors. Read Our Blog for More Ideas!